This topic is the Frequently Asked Questions (FAQ) for the MGSi system. MGSi Web Administrator (MGSi Administrator) are the administrator options in the MGSi Web product. Access to the administrator options are based on the Administrator User option in the user profile. MGSi Web Viewer (MGSi Viewer) are the options that are available to all users based on the configuration performed from MGSi Administrator. What is the criteria for an Important Corporate Document (ICD)? The criteria for an Important Corporate Document (ICD) varies with each organization. In general, an ICD can be defined as any document that if in a legal case, the actual document (record) would be better evidence than a re-compilation of the document from a data store. An example is a tax return that has a legal requirement for record retention. Invoices, signed contracts, work orders and completed government forms are additional examples. A "skin" is a customized MGSi Web Viewer, typically written as an Active Server Page (ASPX) based web application. What is the benefit of using MGSi Web compared to a "skin"? The MGSi Web product responds to changes made in MGSi Web Administrator automatically, providing immediate deployment once the business process is defined. "Skins" typically require programmatic changes to reflect the changes made in MGSi Web Administrator. What is the benefit of using a "skin" compared to MGSi Web? MGSi Web provides a standard user interface, providing access to all features of the MGSi Web product, which may not be suitable for all users in an enterprise. A "skin" allows the user interface to be customized to meet the specific business needs of an enterprise. What is the difference between the MGSi Web Dash Board and a "skin"? The MGSi Web Dash Board is an XML based mechanism that provides single-click access to frequently used functionality within the MGSi Web system. A "skin" can be used to accomplish the same purpose, without exposing the user to the complete MGSi Web system. Do provide customization of MGSi Web? Yes! We will modify the code of the MGSi Web product to meet your specific needs. E.g., we have modified the MGSi Index webpage to display additional grids. What is MGSi Web Light? MGSi Web Light is a slimmed-down version of MGSi Web for the the small screen of a mobile device. Note that you can use MGSi Web Light from a desktop or tablet device. If we host MGSi Web ourselves, what other software do we need to have in order for the system to function? Microsoft Windows Server 2003 and above, or Microsoft Windows 7 and above. Microsoft Internet Information Services (IIS) 6.0 and above. Microsoft SQL Server 2005 and above. For email access, a Collaborative Data Objects (CDO) compliant data source is required. I.e., Microsoft Outlook and Microsoft Exchange. Microsoft Windows Server 2012 and above. Microsoft Internet Information Services (IIS) 7.0 and above. Microsoft SQL Server 2012 and above. For additional information see MGSi Software and Hardware Requirements. Since MGSi has immediate deployment, how do I QA a change in a workflow before promoting the change? From within MGSi Web Administrator, copy the workflow and paste as another workflow within the same document type (see Document Type - Workflow Pane). Modify and test the pasted workflow. When the changes to the new workflow are complete, use the Move option from the MGSi Work Item List webpage to move the work items from the old workflow to the new workflow. See MGSi Viewer Move Workflow (Moving Work to Another Step). You can also create a SQL update query to modify the Workflow column in the WorkItem table. If minimal changes were made to the copied workflow, you can retrofit (re-key) the changes to the original workflow. How many users does MGSi support? The MGSi system limit is 2,147,483,647 users per customer. Is there a restriction on the number of data elements we can use? No. The MGSi system limit is 32,767 items per table. The underlying database providers column limit (usually 512) will be reached before the MGSi system limit is reached. What is the limit on the number of documents the system can support? The MGSi system limit is 2,147,483,647 records (documents/work items); with a limit of 2,147,483,647 files per record (document/work item). We have documents of various types: emails, faxes, PDF files, word documents, spreadsheets, PowerPoint presentations, scanned images, etc. Are there any restrictions on document types? No. The ability of a particular file type to be displayed in a browser depends on the MIME settings, the registry file association for the particular file type, and if the underlying software package correctly works in the browser container. We expect MGSi Web to be used by individuals outside our facility. Is MGSi Web secure? The MGSi Web product requires valid credentials (user ID and password) to access the system. MGSi uses Microsoft Internet Information Services (IIS) which supports the Secure Socket Layer (SSL) providing HTTPS access. In addition to the MGSi system requiring a valid credential to connect to the MGSi Web system, the login ID must be defined in the MGSi Administrator system and assigned to specific workflow steps. The workflow should be configurable and it should give us the capability to track steps to see where each document is in the process (at what step in the workflow). Can we customize alerts and reminders in the system? Part 1. Configuring workflow steps is performed using the MGSi Web Administrator product. One of the primary purposes of the MGSi system is to track where each document is in the process. Part 2. Yes. The MGSi Web Administrator workflow step configuration process provides a mechanism for invoking any third party application when a record (document, work item) is moved from one workflow step to another, and/or when the record (document, work item) is opened. Additionally, the MGSi Auditing and History process provides the data that is used for queue aging. Note that the MGSi Email Events webpage is used to configure when to send email notifications when specific events occur. Additionally, My Great Software, Inc. has implemented a workflow process for one of our clients that sends emails, voice mails or text messages to pre-determined users at specific time events. Also, the Microsoft Scheduled Tasks control panel applet can be configured to launch an alert system on a regularly scheduled interval. Database triggers can be defined that launch an alert system when specific database field values change. Different people will have access to different documents for viewing, editing, sending, etc. Different people may have different access to the same document also. How customizable is it to implement multiple views? The MGSi Web product has eight (8) views: Queue, Index (data entry), Category, Pages, Images, Workflow, Properties and History. Is there a search feature? The MGSi Web product provides extensive search capabilities and is based on the workflow configurations. The MGSi Web Administrator is used to configure which fields can be queried and which fields are displayed in the results -- the fields are defined by you. A Query Wizard is provided for advanced users. Records (documents/work items) can be searched for by workflow step. Individual files can also be queried. Additionally, the MGSi Web product provides a dash board that is configurable to submit customized SQL queries. Is there a forms generator? There is no conventional forms generator (e.g., Microsoft Visual Studio design mode). Rather, based on the configuration of the workflow step Field Settings, the data elements you expose are a de facto forms generator. Do you have various reporting capabilities to track progress, find bottlenecks, etc.? MGSi provides multiple reporting options. The Work Queue Summary webpage lists all defined workflow steps and the number of records that are in each of the workflow steps. The MGSi Administrator program provides graphical representations (charts) of this data. The MGSi Auditing and History process provides the data that is used for queue aging. Note that you can integrate a report writer (e.g. Crystal Reports) with the backend database system and create custom reports to track progress, find bottlenecks, etc. We need the system to have a capability for the documents to be sent via email or fax or posted on the Web. Does MGSi support this? Part 1. To print individual files, the underlying software package must provide a File - Print option when displayed in the browser container. The MGSi Web product has the Detach (Full Screen) option when in Pages view. The Detach option opens the selected file in its own window/program. The file can then be printed using the browsers File - Print menu item or the Print option available for the MIME type. Part 2. The MGSi system provides a categorization process for individual files with the results stored in the database. Based on the categorized values stored in the database, specific content can be published to an external web site. How open is the architecture for future enhancements or additions? The MGSi architecture is "wide" open. The basis for this is that you configure the workflows. The MGSi product is a Microsoft .NET based product. The exposed methods and web services of the MGSi libraries can be used in external applications, if your license grants you this option. Sample applications are available. The data fields are defined by you using the MGSi Web Administrator Data Dictionary. How do I see the "big picture" of the MGSi system? The MGSi canvas defines the business processes and the MGSi Step webpage implements the business rules. The Summary grid - All Work option in MGSi Viewer or the Administrator - Summary option in MGSi Web is used to display the current state of the system. What is the difference between a Work ID and a Document ID? A Work ID is the primary key in the work item table. There is only one work item table in the system. There is a foreign key to the DocID (plus the document type name) in the work item table. A Document ID (DocID) is the primary key in a document type table. Each document type table has a foreign key to the WorkID. There are 1 or more document types per system. What language is the product written in? The MGSi server-side modules are written using Microsoft .NET version 4.0, Microsoft ASP.NET and Microsoft VB.NET. What are the programming skills required for creating a skin with MGSi? How much and what kind of support do you offer for your product? Telephone and email technical support is included with the product license. Training is also available. Customized application development is available based on negotiated contract rates. See My Great Software, Inc. Services. Would we be buying the code or buying the product plus support? 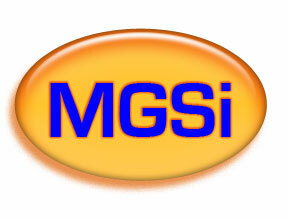 The MGSi Software Product is licensed, not sold. Source code for the core MGSi product is not available. Various support options are available. Do you have various types of licenses? Yes. Each MGSi product requires its own license. A minimal MGSi system consists of the MGSi Administrator and one MGSi Web (Viewer) license. The price of the MGSi product depends on the type of, and number of licenses purchased. Is there a fee for annual support? And if so, how much is that? Yes. Varies with the type of licenses purchased. Who uses the MGSi product? Our customer list includes Brookfield Homes, the Embassy of Ecuador, and Connected Services. Contact Us and we'll be glad to get you started.